India is a country of festivals and there are many exchanges made during the festive season. Be it sweets, gifts, clothes or anything that is suitable for the festival. We believe in sending good pleasantries to our close ones during the time of festivals. To ensure that our gifts reach our loved ones safely, we need to pack them in good quality boxes. Also, since they are gifts, they need to look attractive and pleasing to the eyes. Holi is a festival where we send in such gifts to our relatives. DCGPAC offers some of the best boxes for Holi..
We all know Holi is a festival of colours. So when we send gifts, the packaging should suit the occasion. These Holi boxes are made by keeping the festival in mind and the box is fully colourful. It is quite spacious too so that you can accommodate many things together. 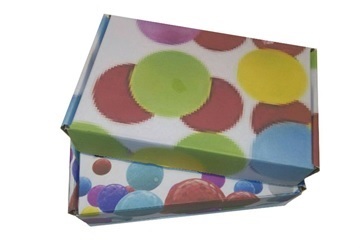 There are prints on the holi box that make it look beautiful and the box has a glossy finish to it. It is also very safe because the box is made with 3 ply and has a lock tab system. This ensures that it won't open up accidentally while shipping. This box is perfectly suitable for rough conditions while in transit. This holi box is available in various sizes so that you can choose the one which fits your needs. No matter what type of products you send in these boxes, your goods shall stay safe and secure till it reaches the concerned person. For something as special as Holi boxes, DCGPAC is the best place you can trust with. The quality of all the products is supreme and you will find them at the most affordable prices. You can buy Holi box online from DCGPAC and be assured of the gift packaging you will be using for Holi. We ensure quick deliveries for all our products so be at the convenience of your home or office and order it online through DCGPAC.